Three generations of the cretan family Klinis present the real cretan warmth and hospitality from the year 1990. Roxani hotel is an absolutely familial greek property and you will feel the home athmosphere from the first moment of your arrival. We take each of our guests as a long-awaited friend. Our main mission is to make your vacation as pleasant as possible. We care about each of our guests, because our hotel is very small! Jor guests usually become our friends, come every year again and again. Family atmosphere, sincere attention to any even minir problem or trouble. Our hotel will become your seaside home for many years! We provide everything for your perfect holidays. The beach you will find in 3 minutes walking distance from the hotel. And on the hotel's territory, near the opened pool, in the middle of blossoming garden there are sunbeds to have a relaxing sunbathing. You can order the cocktail or ice-cream right here in the pool bar. And during the evening the hotel's owner cooks an amazing bbq made of local farmer products, which you can eat for a dinner, sitting in the garden. 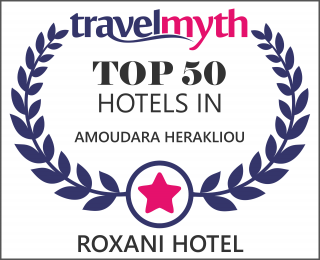 Hotel Roxani is situated not only very close from the beach, bur also in the resort, closest to the city, capital of Crete, Heraklion. From Ammoudara, where the hotel is, is very easy to get to the city, which means all the main attractions of the island are very available to our guests. Our rooms are decorated in traditionat cretan style. Each room has a furnished balcony. Book our hotel for 7 nights and get a one-day bike ride for free! Book our hotel for 10 nights and get one dinner for free! Book a car with us for 3 days and more, and get a dinner for free! Pre-pay for the dinners for all duration of your stay and the last dinner will be for free! *For the additional price you can get cheap and tasty breakfasts, lunches and, of course, amazing dinners in the garden near the pool. Мы всегда останавливаемся в этом отеле и никогда не находили ни одного минуса!Здесь все прекрасно: и номера, и обслуживание, и атмосфера! Спасибо Вам!!. Лучший отель на Крите!